← old is still good. feeling lucky on the 13th. Seriously, I never thought I’d be noticed for my love to cut paper! I am truly LUCKY to have found a hobby and passion that I somehow turned into a career. …and speaking of career, it’s funny when one of Gloria’s friends ask her what I do for a living. Friend: …so what does Sarah do nowadays? G: She… umm… cuts up paper and scrapbooks. She’s actually really good at it. Friend: Oh, neat. …so does she like cut up pictures and glue them to paper? G: Yeah, but she makes it look really good. She also travels and teaches. Friend: That’s great that she is doing what she loves to do. G: Yeah! …and she gets boxes sent to our house all the time with lots of stuff. G to me: Sarah, tell them to stop sending you boxes. There’s no more space in our house! 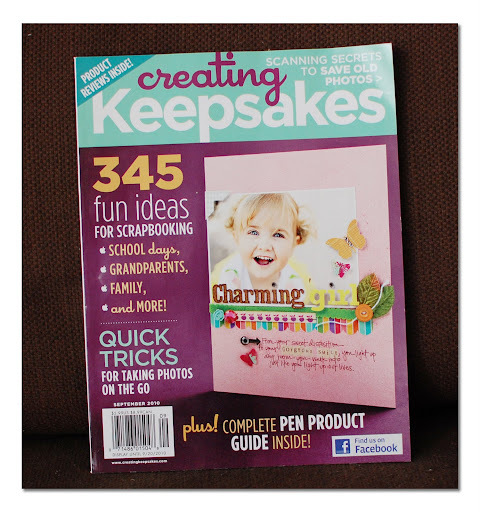 On a completely different note, I had received my monthly issue of Creating Keepsakes in the mail yesterday, but I didn’t know about how great this issue was until someone told me to turn to p. 37 . 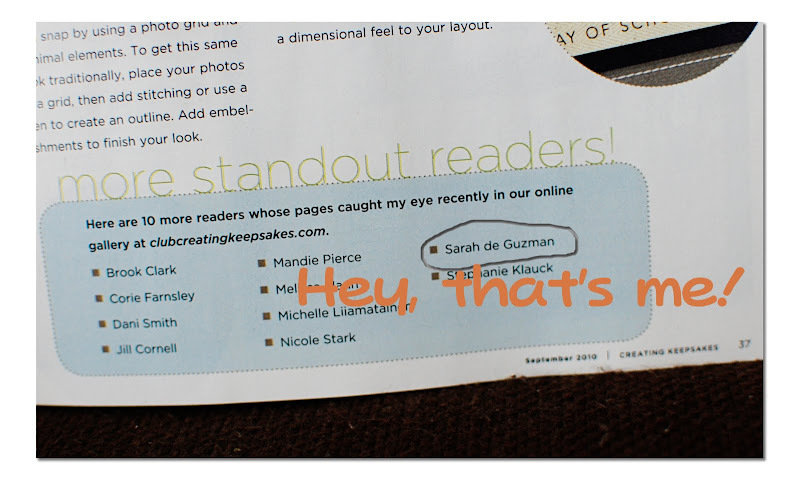 Look who was picked to be a standout reader! Thank you, CK, for picking my name to be amongst an amazing selection of designers. …and I must totally be on a roll, or maybe I’m just LUCKY today. I went to 2peas today, and I saw something that put a smile on my face. Currently, everyone seems to really like My City layout because it was Top 3 by Views, Top 3 Most Liked, and Top 3 Bookmarked. Just so you know, I don’t normally post over at 2peas. Perhaps, I should play over there more often. I also have a couple of projects to share today. My first layout features Jillibean Soup goodness that was generously given to me at CHA. I went a little bit crazy with the punches on this one, hehe. I love this layout because it has photos of me, Deana, and Jing Jing. These girls are amazing designers, so if you haven’t seen their work yet, I highly recommend you visit their blogs for inspiration. My second layout features the latest from Nikki Sivils. These products were also kindly given to me at CHA, so thank you, Nikki, for your generosity. Isn’t that beaver super adorable?! Its teeth are my favorite part to the cute critter. When I saw it, I knew exactly what pictures to use, haha! Wow!! More congrats to you!! 🙂 Cute new layouts. Hope you have a great weekend!! I believe in luck, but I also believe that some hard work goes into it. Congratulations, Sarah, on the recognition for you hard work. You are a wonderful designer and I’m happy to have had the chance to meet you and Gloria at CHA!! just stopping by to say hello .love your work. How wonderful for you – and all so deserved!!!!! Have super weekend! Congrats girl!! You know I think you do amazing work… it’s about time CK caught on! LOL!! I did see your name in CK! Congrats!! And topped viewed at Two Peas–GIRL–that is SAWEEET!! Loving these layouts–you are inspiring me to pick up some paper–haven’t done that in a few days…. I saw your name in CK right away. You are on a roll girl!!! I saw you name in CK, too! Congrats on everything! Your work is amazing! wow! congrats on all the good news…that is pretty exciting…i like the layouts, too! do you think you can do a post one day on tips to get published? i think a lot of your readers would like to know about that. Saw your work over on 2peas! Congrats! Congrats on being selected for the AC design team! Your a local girl; I live in Milpitas and used to live in Sunnyvale. oh fun! where do you normally crop?! Congrats to you on all your good news! That’s really exciting! Congrats on all the goodness…you deserve it you talented chick! As for the LO’s…. totally made me smile. LOVE what you did with the new Nikki Sivils papers. Awesome photos of Gloria. She has a great smile! And ps… I’m the lucky one to have met you. Oh yeah… awesome on the 2Peas spots! You GO, girl! And yes, I saw your name in there! It’s just the beginning…. because soon we’ll see your LO’s in there! What month the first one in? Can’t wait! Very happy for you! Congrats!! I have internet right now and I’m so happy I was able to read about you and all your famous-ness! Too cool! And I love that LO with the beaver-so cute! Congrats and more congrats! You’ve got it goin’ on girl! 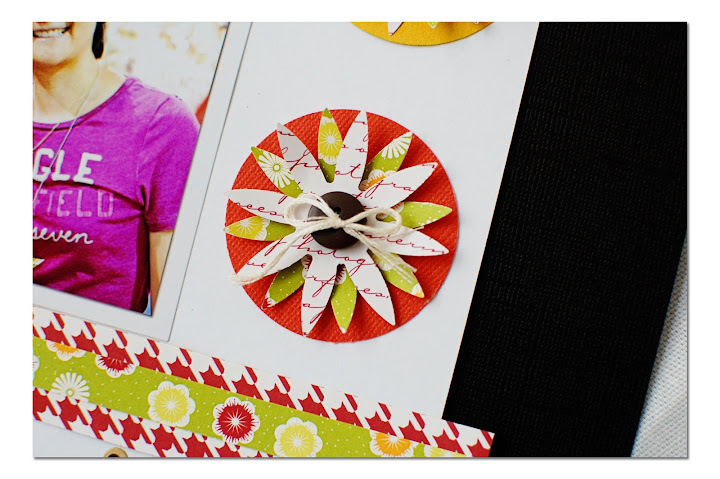 You are totally rockin’ the scrapbook scene! Way to go Sarah! Congrats on all your success, I can’t imagine how busy you must be, you’re an inspiration to us all. Love the layouts, the new Nikki Sivils products are my favorite I think, I love that beaver it’s so cute. WOW, there’s a lot of happines going on on your blog! Congrats! 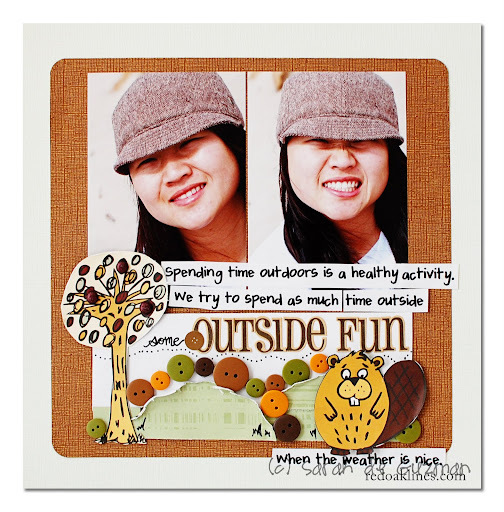 I saw your layout featured on 2peas (although I don’t go there often…) YEAY! Oh, it’s not LUCK at all, my dear. You are THAT good. You deserve the praise…so happy for you! Love all your latest! Hard working woman, a constant inspiration for many, good person, great artist…. Any recognition you are getting you deserve!!! . Sounds like you truly did have a very lucky Friday the 13th, Sarah! Huge congrats to you for all your recent recognitions! 🙂 And yes, please come play at 2Peas more often. We want to see you there! Love the pages you’ve posted today. That beaver is adorable. Love the scene you’ve created there. And those flowers on the 1st page are stunning. did you create those with the punches? YAY!! HUGE Congrats coming to you. YOU ROCK! WOW Sarah you are on a roll, congrats!!! And I loved that conversation so funny!!! Great lo’s as ever love the one with you and Deana!! What a fabulous Friday the 13th! The interview with Gloria is the funniest!!! !